The Boeing X-48 Blended Wing Body subscale research aircraft made its 100th flight in late October at NASA's Dryden Flight Research Center at Edwards Air Force Base, Calif. The milestone occurred Oct. 30 when the unmanned X-48C aircraft was flown on two separate 25-minute flights -- the seventh and eighth flights for the X-48C since it began flying Aug. 7. Between 2007 and 2010, the aircraft, then in the X-48B configuration, made 92 flights. "Once again, working closely with NASA, we have been pleased to pass another flight-test milestone in our work to explore and validate the aerodynamic characteristics and efficiencies of the Blended Wing Body concept," said Boeing X-48 project manager Mike Kisska of Boeing Research and Technology. "We are thrilled by the continued success of our flight testing and the useful data that we have collected during the first eight X-48C flights," added Heather Maliska, NASA Dryden's X-48C project manager. 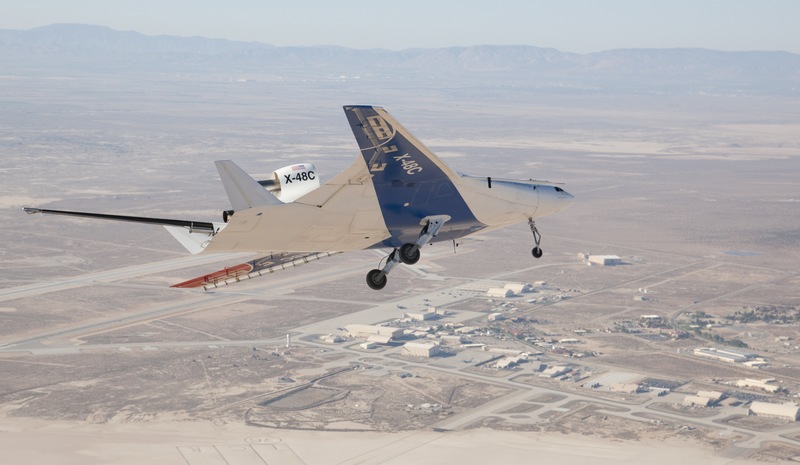 Kisska noted that with 100 test flights flown, the X-48 has far surpassed the previous record of 40 flights performed by a single unmanned X-plane, held by one of the X-45A Joint Unmanned Combat Aircraft technology demonstrators, also developed by Boeing. The X-48 is a scale model of a heavy-lift, subsonic aircraft that forgoes the conventional tube-and-wing airplane design in favor of a modified delta design that effectively blends the vehicle's wing and body into a smoothly contoured configuration. Boeing and NASA believe the blended or hybrid wing body concept offers the long-term potential of significantly greater fuel efficiency and reduced noise. Boeing's blended wing body program manager Bob Liebeck said earlier flight tests of the X-48B proved that a blended wing body aircraft can be controlled as effectively as a conventional tube-and-wing aircraft during takeoffs and landings and other low-speed segments of the flight regime. With the X-48C, the team has been evaluating the impact of noise-shielding concepts on low-speed flight characteristics. The X-48C, which was modified from the previous X-48B version, is configured with two small 89-pound-thrust turbojet engines instead of the three 50-pound-thrust engines on the B-model. The wingtip winglets on the X-48B have been relocated inboard next to the engines on the C-model, effectively turning them into twin tails, and the aft deck was extended about two feet at the rear. The Boeing-NASA team expects to fly the X-48C approximately 20 more times before the flight-test program concludes. The upgraded X-48C version of Boeing's Blending Wing Body subscale research aircraft banks over Rogers Dry Lake at Edwards Air Force Base during a test flight Oct. 16, 2012. 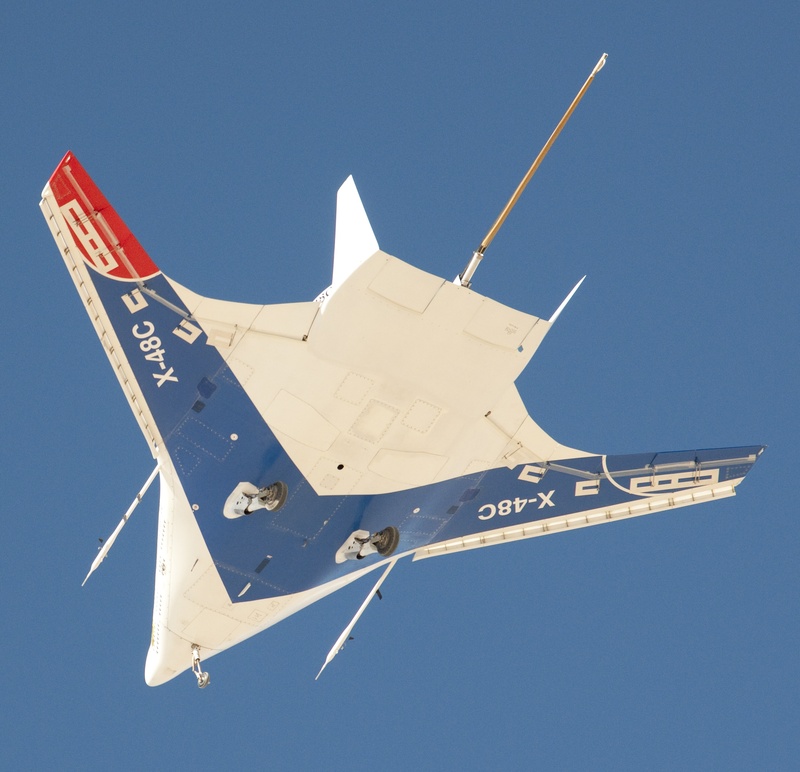 Combined with the earlier X-48B version, the X-48 technology demonstrator has now flown 100 test missions. Boeing's X-48C Blended Wing Body research aircraft is silhouetted against the morning sky over Edwards Air Force Base during its fifth test flight on Oct. 16. It has flown eight times since Aug. 7.